Democrats plan on holding a series of global warming hearings when they take power in 2019. The hearings will “explore the best solutions to combat this challenge,” according to Democrats. However, Democrats aren’t in agreement on how to broach the climate issue. Three top Democrats plan to kick off their upcoming tenure chairing House committees with a series of hearings on global warming. Incoming Democratic committee chairs announced the global warming hearings the day after incoming New York Rep. Alexandria Ocasio-Cortez and environmental activists occupied House Minority Leader Nancy Pelosi’s office to demand action on global warming. House committees will hold hearings over a two-day period early in 2019 on the effects and “explore the best solutions to combat this challenge,” top Democrats said in a joint statement Wednesday. “Our rapidly changing climate, and the Trump administration’s efforts to take us in the wrong direction, seriously jeopardize our future,” said Democratic Reps. Frank Pallone of New Jersey, Raul Grijalva of Arizona and Eddie Bernice Johnson of Texas. Pallone will chair the Committee on Energy and Commerce, Grijalva will chair the Committee on Natural Resources and Johnson will take over the Committee on Space, Science and Technology. 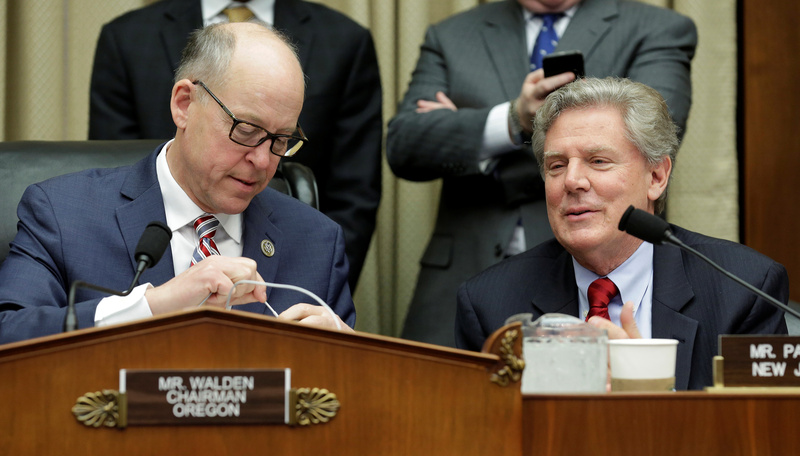 Chairman of the House Energy and Commerce Committee Greg Walden (R-OR) and ranking member Frank Pallone (D-NJ) speak during the markup of the the American Health Care Act, the Republican replacement to Obamacare, on Capitol Hill in Washington, U.S., March 8, 2017. REUTERS/Joshua Roberts. “We plan to hit the ground immediately with a series of hearings early in the next Congress on how best to combat this growing global crisis,” the three incoming committee chairs said in a joint statement. “Our committees plan to work closely together to aggressively assess the public health, economic and environmental impacts of climate change and to explore the best solutions to combat this challenge,” they said. While tackling global warming has been a pet Democratic issue for years, liberal lawmakers are torn on how to broach the issue when they take control of the House in 2019. Pallone and Johnson, for example, opposed Pelosi’s plan to revive a long-defunct House select committee on global warming. “I don’t think it’s necessary,” Pallone told Politico on Tuesday. “We have great people who want to take action on climate change who will be chairing the committees of jurisdiction and we got of people on the committees that are real champions,” Pallone said. 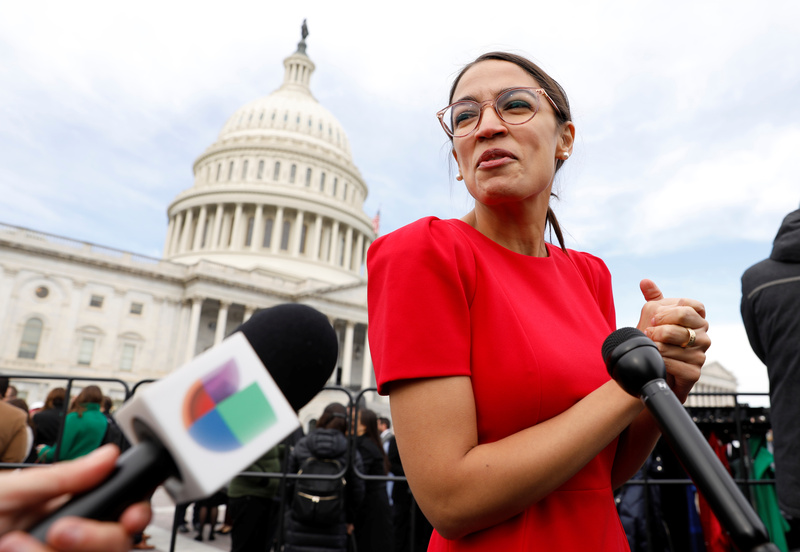 Democratic Representative-elect Alexandria Ocasio-Cortez of New York talks with reporters as she arrives for a class photo with incoming newly-elected members of the U.S. House of Representatives on Capitol Hill in Washington, U.S., November 14, 2018. REUTERS/Kevin Lamarque. Pelosi said in a statement she was “inspired by the energy and activism of the many young activists and advocates leading the way on the climate crisis.” Pelosi argued Democrats’ infrastructure agenda would help address global warming. “House Democrats ran on and won on our bold campaign for a $1 trillion investment in our infrastructure that will make our communities more resilient to the climate crisis, while creating 16 million new good-paying jobs across the country,” Pelosi said.